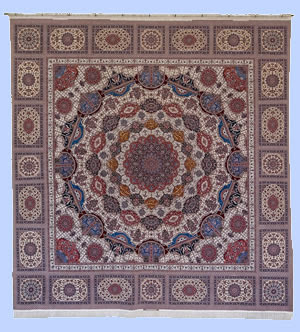 Iranian carpet recently presented to the U.N. Source: Iranian Permanent Mission in New York. Awhile back, I wrote that I'd been recruited by my colleagues at War Times/Tiempo de Guerras to draft a flyer for peace activists about the looming prospect of a U.S. attack on Iran. I wasn't sure just what it ought to include, but I shared a recipe for working on such a project. Events and the forms of the threat still seem unclear, but it is certain that we need a better grasp of some basics of the geopolitical context. So here is a version of a flyer text that has seen some collective editing. Remember, this is supposed to be a simple story for the curious. Opinions are very welcome, either in comments or by writing the email at the right. Iran is a large West Asian country of some 69 million people. It is bounded by Iraq to the west and Afghanistan to the east. Iran (ancient Persia) has been home to successive civilizations for 6000 years, often the bridge culture between the European West and South and East Asia. Iranians are Muslims, 90 percent from the Shi'a tradition. No other country has such a high proportion of Shiite believers, though both Iraq and Lebanon are majority or near majority Shiite. Although Iranians are mostly Muslims, they are not Arabs. Arabs are persons who trace their ancestry to the Arabian Peninsula (modern Saudi Arabia) but live in many countries of the Middle East (including Iraq) and North Africa. They usually speak the Arabic language. In contrast, fifty-one percent of Iranians are ethnic Persians who speak Farsi; most of the rest derive from several Central Asian peoples. Iran is sitting on "the second-largest pool of untapped petroleum in the world." Oil and Gas Journal, cited at Common Dreams. Iran is a quasi-theocratic/quasi-democratic state formed after the Islamic Revolution of 1979. The country has both contested popular elections and a very powerful governing body of Islamic clerics. The Islamic Revolution arose in opposition to a brutal Western-supported monarchy. The monarch, called the Shah, seized autocratic power in 1953, after the U.S. engineered a coup against Iran's populist, democratically elected prime minister. An assertive, often anti-U.S., nationalism is part of the fabric of Iranian politics. In the 1980s, Iraq invaded Iran with United States support. The two countries fought a brutal war marked by trench combat, Iraq's use of poison gas, and nearly one million casualties on the two sides. After the Gulf War of 1991, President George Bush the elder incited Iraqi Shi'a to rise against Saddam Hussein's government. When this rising was crushed, many Shiite leaders, including many now in Iraq's elected government, took refuge in Iran. Southern Iraq, specifically Najaf and Karbala, are sites of holy pilgrimage for Iranian Shiites. If peace prevailed, millions of Iranian pilgrims would travel to these places annually. Iran harbors Al-Qaeda: Not likely, Al-Qaeda preaches a Sunni-exclusive Islam deeply hostile to Iran's Shi'a rulers. Iran has handed over Al-Qaeda suspects to the U.S. as recently as 2003. Iran is supplying forces attacking U.S. troops in Iraq: Not likely. Most attacks on U.S. forces have been by the Sunni-based resistance to the occupation. If Iran is arming any forces in Iraq, it is the militias of various Shi'a parties -- that is, paramilitary forces of the Iraqi government. At a Baghdad "show and tell" about purported Iranian bomb materials, U.S. briefers would not allow their names to be used or pictures to be taken of the "evidence." Iran is trying to make a nuclear bomb: Iran has signed the Nuclear Non-Proliferation Treaty. It regularly allows U.N. International Atomic Energy Authority inspectors access to its nuclear facilities. Under that treaty, Iran has the right to enrich uranium in order to make electrical power. This program is the focus of arms control concern as the some process can be used to make weapons. Iran says it does not intend to make a bomb. The U.S. says it does. All intelligence agencies (with the possible exception of the Israelis) say that it would be years before Iran could make a nuclear weapon if that is its true intent. U.N. officials recently asserted that U.S. "evidence" about a planned Iranian bomb has not proved true. Why is the Bush administration threatening Iran? Hard to know, but losing a war in Iraq and killing thousands of U.S. troops and hundreds of thousands of Iraqis doesn't seem to have made them more reasonable or cautious. And there is all that oil. Although there are no more U.S. troops to pour into another invasion, naval and air power could do vast human damage in Iran. Congress does have the power to stop an attack on Iran. There is no question that under the Constitution, Congress can refuse to allow the executive to spend our tax money on another war. "What do the Yanks care about a dead Arab?" "We need a flyer"...War on Iran ahead?